It's been a long time coming, but finally there's a touchscreen BlackBerry in the same Bold body we all love (or hate.) Coming in a 4G HSPA+ 9900 flavor and CDMA EV-DO 9930 variant, the handset also runs on a newly-improved BlackBerry OS, numero 7. But back to the phone's hardware for a second. Both models have 2.8-inch touchscreen (capacitive) displays with 640 x 480 resolution, and run on a 1.2GHz processor with 768MB of RAM. There's also 8GB of onboard memory, along with a microSD card slot for storing more data on—such as the photos and 720p video you can shoot on the 5MP camera. 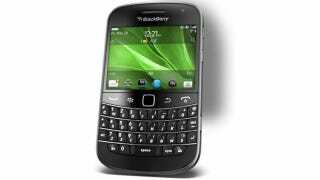 WATERLOO, ONTARIO—(Marketwire - May 2, 2011) - Research In Motion (RIM) (NASDAQ:RIMM)(TSX:RIM) today unveiled two new BlackBerry® Bold™ smartphones. The high-performance BlackBerry Bold 9900 and 9930 smartphones feature a stunning and iconic design that integrates an incredibly easy-to-use BlackBerry keyboard with a brilliant, high resolution, capacitive touch screen. These exceptional smartphones are built on a new, performance-driven platform powered by the BlackBerry® 7 operating system and designed to deliver the ultimate in communications, multimedia and productivity for users around the world.